ANGLED FOR THE PERFECT SWEEP. MAGNETIZED AND ALWAYS ON STANDBY. A magnetic retractable highlighter brush that attaches to your favorite Match Stix Shimmer Skinstick for seamless blending in a snap. Take your glow places it’s never been before. The magnetized Portable Highlighter Brush 140 was born to snap to your favorite Match Stix Shimmer Skinsticks, letting you create your own custom highlighting collection. Slanted, soft synthetic brush hairs trace the angles of your face expertly designed to diffuse Shimmer Skinsticks with speed and precision you’d never imagine from a highlighter brush this petite. And thanks to its medium-density bristles, you can build glitz to your perfect level of impact. Retractable and totally portable, this is the perfect travel makeup brush you’ll never leave home without. 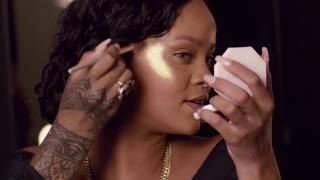 Rihanna wanted to create an effective, high-functioning retractable highlighter brush that was portable and magnetized for convenience - perfect for travel! For the most impact, apply Match Stix Shimmer Skinstick directly on your face and blend with Portable Highlighter Brush. For a softer look, stroke brush over product first, then blend as desired. ARTISTRY PRO TIP: For the most buildable wear, warm up Match Stix on the back of your hand, then use brush to apply and blend over desired areas. PORTABLE HIGHLIGHTER BRUSH is rated 5.0 out of 5 by 3. Rated 5 out of 5 by mibbles5 from Love !! i️ like this product because it is great and i️ like i️t!